Ian Goodison's first-half strike was enough to secure Tranmere's place in the Carling Cup second round at the expense of Walsall. Goodison latched onto Joss Labadie's header across the face of the Saddlers goal to finish from close range. The home side were undone by poor finishing from Steve Jones, Julian Gray and Alex Nicholls. Nick Wood should have extended Tranmere's lead but his close-range header went over the bar. "We said before the game, all of the lads had something to prove after Saturday's performance. I'm sure they all felt they could do better and I think to a man, every one of them did better. "I would have liked it if we weren't hanging on in the last few minutes but I would have taken that before the game, so I'm quite happy." 90:00+2:55 John Welsh takes a shot. Comfortable save by Joe Collister. 90:00+2:05 Defending throw-in by Aaron Lescott (Walsall). 90:00+1:55 Attacking throw-in by Liam Darville (Tranmere). 90:00+1:22 Attacking throw-in by Liam Darville (Tranmere). 90:00+0:57 Attacking throw-in by Liam Darville (Tranmere). 89:04 Substitution Darryl Westlake goes off and Clayton McDonald comes on. 88:39 Steve Jones takes a inswinging corner from the right by-line played to the near post. 87:44 Darren Byfield has a curled shot. Save by Joe Collister. Matthew Richards takes a shot. Comfortable save by Joe Collister. 86:55 Attacking throw-in by Aaron Cresswell (Tranmere). 83:32 Attacking throw-in by Liam Darville (Tranmere). 83:12 Attacking throw-in by Liam Darville (Tranmere). 81:15 Attacking throw-in by Liam Darville (Tranmere). 80:59 Attacking throw-in by Liam Darville (Tranmere). 79:36 Outswinging corner taken by Paul McLaren from the right by-line, Joss Labadie takes a shot. 79:07 Unfair challenge on John Welsh by Matthew Richards results in a free kick. Indirect free kick taken by John Welsh. 78:56 Attacking throw-in by Aaron Lescott (Walsall). 78:19 Free kick awarded for an unfair challenge on Matthew Richards by Joss Labadie. Jon Brain takes the indirect free kick. 77:51 Attacking throw-in by Aaron Cresswell (Tranmere). 77:08 Free kick awarded for an unfair challenge on Terry Gornell by Steve Jones. Indirect free kick taken by Liam Darville. 76:32 Defending throw-in by Liam Darville (Tranmere). 75:52 Attacking throw-in by Aaron Cresswell (Tranmere). 75:31 Goal kick taken long by Joe Collister (Tranmere). 74:45 Attacking throw-in by Aaron Cresswell (Tranmere). 74:10 Defending throw-in by Aaron Cresswell (Tranmere). 72:59 Defending throw-in by Aaron Cresswell (Tranmere). 72:13 Corner from left by-line taken by Julian Gray. 72:13 Booking Nick Wood receives a yellow card. 71:07 Goal kick taken long by Joe Collister (Tranmere). 70:22 Attacking throw-in by Aaron Lescott (Walsall). 67:50 Defending throw-in by Darryl Westlake (Walsall). 67:23 Attacking throw-in by Aaron Cresswell (Tranmere). 65:50 Defending throw-in by Darryl Westlake (Walsall). 65:29 Defending throw-in by Darryl Westlake (Walsall). 64:51 Substitution Paul Marshall replaces Richard Taundry. 64:33 Substitution William Grigg on for Alex Nicholls. 64:25 Goal kick taken long by Joe Collister (Tranmere). 63:42 Attacking throw-in by Aaron Lescott (Walsall). 63:18 Goal kick taken long by Jon Brain (Walsall). 62:50 Foul by Julian Gray on Paul McLaren, free kick awarded. Free kick taken by Paul McLaren. 62:39 Defending throw-in by Aaron Lescott (Walsall). 62:16 Attacking throw-in by Darryl Westlake (Walsall). 61:21 Goal kick taken long by Joe Collister (Tranmere). 60:58 Attacking throw-in by Aaron Lescott (Walsall). 60:33 Goal kick taken long by Jon Brain (Walsall). 59:45 Joss Labadie fouled by Julian Gray, the ref awards a free kick. Joe Collister restarts play with the free kick. 58:56 Effort from the edge of the box by Darren Byfield goes wide of the right-hand upright. 57:21 Attacking throw-in by Julian Gray (Walsall). 56:15 Defending throw-in by Richard Taundry (Walsall). 55:39 Steve Jones takes a outswinging corner. 55:14 Attacking throw-in by Richard Taundry (Walsall). 54:40 Goal kick taken long by Jon Brain (Walsall). 54:17 Attacking throw-in by Liam Darville (Tranmere). 54:06 Attacking throw-in by Liam Darville (Tranmere). 53:06 Goal kick taken long by Joe Collister (Tranmere). 50:39 Outswinging corner taken right-footed by Paul McLaren, Nick Wood has a headed effort at goal from just inside the area that misses to the right of the target. 49:20 Effort on goal by Richard Taundry from long range goes harmlessly over the bar. 48:32 Alex Nicholls takes a shot. Joe Collister makes a comfortable save. 46:52 Foul by Aaron Lescott on Terry Gornell, free kick awarded. Free kick taken by John Welsh. 46:12 Inswinging corner taken from the left by-line by Paul McLaren. 45:30 Joss Labadie takes a shot. Blocked by Oliver Lancashire. 45:00+1:27 Goal kick taken long by Joe Collister (Tranmere). 45:00+0:48 Unfair challenge on Richard Taundry by Joss Labadie results in a free kick. Darryl Westlake restarts play with the free kick. 45:00+0:14 Goal kick taken long by Joe Collister (Tranmere). 44:45 Effort from outside the penalty box by Matthew Richards goes wide right of the target. 44:21 Attacking throw-in by Richard Taundry (Walsall). 44:11 Attacking throw-in by Darren Byfield (Walsall). 43:21 Defending throw-in by Darryl Westlake (Walsall). 39:33 Assist on the goal came from Enoch Showunmi. 39:33 GOAL - Ian Goodison:Walsall 0 - 1 Tranmere Ian Goodison fires in a goal from inside the six-yard box to the bottom left corner of the goal. 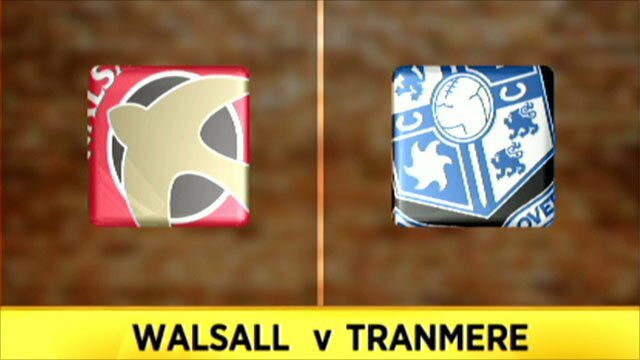 Walsall 0-1 Tranmere. 38:56 Enoch Showunmi fouled by Emmanuele Smith, the ref awards a free kick. Indirect free kick taken by Paul McLaren. 38:44 Defending throw-in by Darryl Westlake (Walsall). 38:01 Attacking throw-in by Liam Darville (Tranmere). 37:35 Goal kick taken long by Joe Collister (Tranmere). 36:34 Outswinging corner taken left-footed by Julian Gray, Emmanuele Smith takes a shot. 35:44 Defending throw-in by Aaron Lescott (Walsall). 34:39 Julian Gray takes a shot. Save made by Joe Collister. 32:54 Darren Byfield is penalised for handball and concedes a free kick. Joe Collister restarts play with the free kick. 32:14 Attacking throw-in by Aaron Lescott (Walsall). 31:46 Goal kick taken long by Jon Brain (Walsall). 31:12 Attacking throw-in by Aaron Lescott (Walsall). 30:31 Attacking throw-in by Aaron Lescott (Walsall). 27:50 Darryl Westlake takes a shot. Blocked by Joss Labadie. 26:57 John Welsh concedes a free kick for a foul on Matthew Richards. Free kick taken by Richard Taundry. 26:19 Attacking throw-in by Ian Thomas-Moore (Tranmere). 24:39 Attacking throw-in by Aaron Lescott (Walsall). 24:10 The assistant referee signals for offside against Ian Thomas-Moore. Jon Brain restarts play with the free kick. 23:47 Attacking throw-in by Liam Darville (Tranmere). 23:26 Attacking throw-in by Steve Jones (Walsall). 21:54 Goal kick taken long by Joe Collister (Tranmere). 21:12 Nick Wood gives away a free kick for an unfair challenge on Richard Taundry. Direct free kick taken by Matthew Richards. 20:59 Attacking throw-in by Aaron Lescott (Walsall). 20:33 Joss Labadie handles the ball and concedes a free kick. Jon Brain takes the free kick. 20:18 Attacking throw-in by Aaron Cresswell (Tranmere). 19:35 Julian Gray is adjudged to have handled the ball. Joe Collister takes the direct free kick. 18:34 Defending throw-in by Aaron Cresswell (Tranmere). 17:23 Attacking throw-in by Julian Gray (Walsall). 16:40 Unfair challenge on Alex Nicholls by Nick Wood results in a free kick. Matthew Richards restarts play with the free kick. 15:53 Defending throw-in by Aaron Cresswell (Tranmere). 15:36 Defending throw-in by Aaron Lescott (Walsall). 14:43 Goal kick taken long by Jon Brain (Walsall). 13:14 Defending throw-in by Darryl Westlake (Walsall). 12:11 Foul by Darren Byfield on Paul McLaren, free kick awarded. Joe Collister restarts play with the free kick. 11:54 Defending throw-in by Liam Darville (Tranmere). 10:53 Attacking throw-in by Liam Darville (Tranmere). 9:56 Short corner taken by Paul McLaren. 9:26 Attacking throw-in by Aaron Lescott (Walsall). 9:04 Defending throw-in by Aaron Lescott (Walsall). 8:43 Defending throw-in by Aaron Lescott (Walsall). 8:39 Goal kick taken long by Joe Collister (Tranmere). 7:52 Defending throw-in by Aaron Cresswell (Tranmere). 7:23 Attacking throw-in by Aaron Lescott (Walsall). 7:08 Attacking throw-in by Julian Gray (Walsall). 6:30 Alex Nicholls fouled by Ian Goodison, the ref awards a free kick. Free kick taken by Darryl Westlake. 5:52 Steve Jones takes a shot. Save by Joe Collister. 5:06 Defending throw-in by Darryl Westlake (Walsall). 4:36 Attacking throw-in by Aaron Lescott (Walsall). 4:08 Outswinging corner taken right-footed by Steve Jones, clearance made by Ian Goodison. 3:15 John Welsh decides to take a short corner. 2:50 Defending throw-in by Aaron Lescott (Walsall). 2:39 Goal kick taken long by Joe Collister (Tranmere). 1:48 Steve Jones takes a inswinging corner from the right by-line played to the near post, Richard Taundry produces a left-footed shot from just outside the penalty area that goes harmlessly over the target. 1:35 Attacking throw-in by Steve Jones (Walsall). 1:13 Free kick awarded for a foul by Joss Labadie on Richard Taundry. Matthew Richards restarts play with the free kick. 0:33 Attacking throw-in by Steve Jones (Walsall).